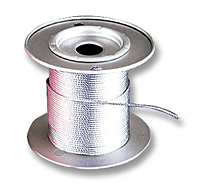 Bulk aircraft cable cut to length or on spools is available from stock in galvanized steel or stainless steel, bare or coated. Construction is 7 x 7 aircraft quality for strength and flexibility. Bulk cable allows you to make your own aircraft cable assemblies. Save yourself the hassle of making steel lanyards in house and ask us for a quote on complete Steel Lanyard Assemblies! Sold by the foot. Please specify quantity. Our recent advances in automation allow us to produce high quality Steel Lanyards at prices competitive with imports and with FAST lead times.